An artist friend of mind mentioned that as artists we really paint the same painting over and over again. Subject and Object matter may change but the Core matter does not. Patterns of work, approach, organization, deep themes appear over and over again. As much as we think we make progress, the progress is a fog of technical mastery and emotional depth. What makes us artists, what drives us to spend hours in the studio, what brings us to manic highs and depressive lows? Lecture first given at the University of Arkansas at Little Rock, Fine Arts Building, April 17. An artist friend of mind mentioned that as artists we really paint the same painting over and over again. Subject and Object matter may change but the Core matter does not. Patterns of work, approach, organization, and deep themes appear over and over again. As much as we think we make progress, the progress is a fog of technical mastery and emotional depth. What makes us artists, what drives us to spend hours in the studio, what brings us to manic highs and depressive lows? Warren Criswell calls it our addiction - the art drug. The art drug results in the high we get when we complete a solid piece of work. Its the low we experience after a show is hung. Its the ever increasing need for storage and money for supplies. But that’s just the psychological and physical affects of the art habit. The real frustration of art isn’t the work per se. After a while, we can forget about technical issues. We can push the material to do what we want and get what we want. The real frustration of art is the realization that all of our previous work is past and moribund and that every thing we make will come from that pile of past work. I was looking over paintings I had made in 1972. Typical student work. Attempting to make something original by negating every thing I had learned about good painting and combining two disparate styles: Clifford Still and Phillip Guston. But what struck me was how close those paintings looked and felt to my current thumbnails. The same self-enclosed stories, the diagrammatic elements of the work and the space between each idea or impulse. This was an aesthetic epiphany. As artists, we change the subject matter (the story) and the object matter (the elements) but we can’t change the core matter - the indescribable and intangible chemical, electrical, biological makeup of our psyche - the conglomeration of memories and emotions that require expression. We may never come to grasp or even understand what that core is but it remains stubbornly fixed and reinforced throughout our lives. The frustration, therefore, is how important that core is to creating our subject matter and how insignificant our subject matter is to expressing it. The art drug is the need, the compulsion, to express the core through our work so well and completely so as never to have to experience it again. When I arrived in NYC in the 70s, an artist wanting to tell stories was stuck with performance or theater or relegated to irrelevancy. I had to find a way to translate what I wanted to do into another form. This was my mindset when I came to NYC: an anti-technique, anti-intellectual, anti-compositional aesthetic where self-contained stories are piled up as blotches on the canvas. In NY, the blotches became individual stories designated by furniture and spot lights and placed within sections on a large carpet/canvas. A year later, the written sections of my Performances become individual collage elements that linked one line with one image with an attention to the imagined space between both one line of text with another non-sequential text and one found image and another. A year later, the projection of that collage into a theatrical space. The complete play is located here. This concept comes from Shapiro via Newman: There is a difference between subject matter and object matter. The subject matter is the story or theme you want to express to the viewer. Object matter is the plastic elements used to convey the story or theme. The theme or story can be similar and still take on different forms. Once you understand the difference you open your work to possibilities. Two events shaped my beliefs about what a great work of art should be. 55 years ago, I saw a Bugs Bunny cartoon in which Bugs, dressed in an artist smock and beret, and dipping a large brush into a bucket of paint, paints the Mona Lisa in two passes of his hand. This was an amazing thing to watch. I could never figure out how he did that. Every time I lifted a brush it appeared to be so limited. But later I realized what that joke really meant for the artist: create the greatest amount of significance with the least amount of effort. You see it in masterful work. It only seems like the piece just appeared fully formed and effortless. While studying art history in Italy, I visited a monastery. Walking into a dark cell from a long sun drenched corridor, it took a while for my eyes to just and I noticed that I could only make out parts of a fresco. As I waited for the image to fully appear I made out a crown of thorns, and then a stick, and a bloody gash. And then to my astonishment, I realized that there was no complete image. The artist had created a painting that every monk could complete in his own way. This unknown artist had produced the most devotional piece of art I have ever seen. Both of those experiences came to define my approach to art. For me, that meant finding out what was extraneous to image making, discovering how far could I go towards developing a story without losing an image. And that meant no color, no printmaking process, no chemical/digital processes at all…. Simple mark making. These pre-concepts provided a way to form my subject matter but didn't explain the continuity of the type of themes and stories I was telling. There was something deeper working on my art - a fundamental matter in my work that would never change regardless of the subject matter and the object matter. This core matter, ever present, would only be consciously realized with experiencing Keaton and Kafka's work. As a part of the audience and as a reader, I was drawn into their work. I found a connection to it. More importantly, Keaton and Kafka provided me with a visualization and verbalization of what I could never on my own identify. While I was expressing this core through my subject matter, those artists gave me a way to understand it. © 2001 Kino International Corp.
My core held a character combined of Keaton's heroic comic figure situated in an environment created by Kafka - a Goofy-Existentialism. Why this particular core matter is a mystery to me. Maybe my daughter, a neuroscientist to be, may discover it. But I'm sure growing up where and when I did had something to do with it. In the 1960s, Sioux Falls, SD was a mid-western city of 60,000 people and I was one of the approximately 500 people that made up the Jewish population of Sioux Falls. I grew up hearing about the fights my father and his brother had during the 1930s with the children of the local German American bund. My grandfather owned several stores (called the People's Store) that catered to those same Nazi sympathizers and that actually saved a number of family farms during the depression with his generosity and business acumen. By the time I was in school there was none of that overt prejudice, only patronizing actions and ignorance about what being Jewish meant. My grandparents had moved to America to escape the pogroms in the Ukraine and Russia during the late 1890s and early 1900s. I had heard about the Cossacks and the pogroms and, of course, the holocaust from my relatives. More than anything else, knowing that the social fabric of society could so easily be torn preoccupied my work. Richard Foreman wrote that only by experiencing hysterical moments could we really know who we are. In many ways, the expression of my core matter seeks that visualization in my subject matter. 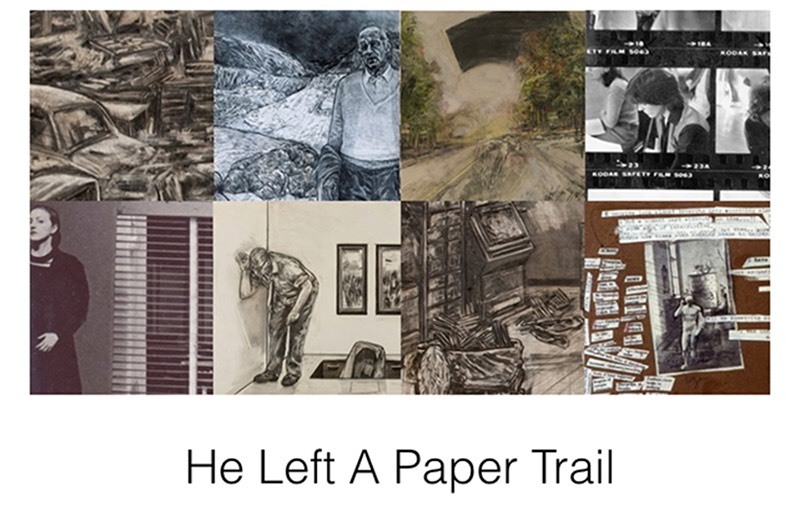 So in a sense, the work produced for the series Paper Trails have clear links to my core - the Keaton character trapped in a Kafkaesque situation. As such the characters inhabiting my subject matter don’t contain the proactive and defiant stance of Max Beckman’s Modernist character of which he says, “Nothing remains to him but protest - the only inner freedom - and with that one is to live;” but the hapless Post-Modernist figure left with only persevering no matter how absurd that action may be. Even this stance is funny to me. I go to bed each night thinking to myself, "You idiot, nothing happened today. Nothing catastrophic has ever happened in the, what?, six decades of your life. Your family is safe. They love you and care for you. The rule of law and order still prevails. You have a safe and secure house and position. Your worries were a waste of time and energy. You are an idiot." And I go to sleep. But then in the morning I think, "Today. Today is the day the Cossacks come." And it starts all over again. Resnick. Clip from A World of Art: Works in Progress: Part 7. But I digress into my bountiful and fertile psyche. What I want to say is that when there is a connection between the core matter and the artist's subject matter, the artist produces what he/she considers valid work. But when that connection is blocked or severed the artist experiences the horrid and feared PIT. Back in the 1990s I would have constant periods of productivity alternating with periods of aesthetic constipation. I knew productivity was going to end because I began to repeat myself, use the same subject matter over and over without adding anything to the story or narrative. In this example, I was interested in taking a visual overlap and substituting it with a written one. I wanted to create a kind of play between the speed of viewing the picture and the time it took to read the label and the different viewing distances required for viewing and then for reading. The idea was reasonable and interesting but when I painted the landscapes I would go into a kind of trance where choosing a color, and then mixing and applying the paint was a fluid action. I didn't make decisions as much as just moved from eye to hand without any conscious action. I was in THE ZONE. The zone is a state of bliss - it is cut off from the core and where the core matters nothing. The images, technically proficient, are just shadows of other work. They are wallpaper. That is why I stopped painting. Since this technique/method provided me with no blowback, no resistance and no active play between material and idea, I couldn’t expect my viewers to be interested in work either. This is what Resnick means when he talks about creating some kind of technique to avoid the pit. Confronting the pit is the only answer to relinking the core matter with the subject matter - the only way to remain an artist. The following are a couple of the many drawings I destroyed during a two-year period beginning in 2010 while experiencing Resnick's Pit. How do you know you are in a pit? You repeat your self, recirculating old ideas without adding anything to the story, contriving ideas or stories that have no hook to them or creating work where you are completely in the zone - where you are no longer engaged in constructing the work but just executing it. After a period of incredible production — nothing. Creating within the pit is a completely completely frustrating, maddening and gut wrenching period. And, the most maddening and frustrating part of the pit is that you can tell when you are stepping into it but can't do anything about it. I was in the pit for two years erasing and destroying work. I spent many hours moving charcoal from one point to another — tracking and tracing ghosts. More charcoal accumulated on my studio floor than on the drawing. In this studio/cubicle seeing traces of my footprints provided significant evidence that some kind of life had taken place. Those footsteps made it even more obvious that I had not produced anything of value. I began to realize that there was no real difference between the erasure and the drawing. And with that realization, I began to emerge from my two year long pit. I began remembering my years I supported myself as a part-time, full-charge bookkeeper in New York City. I handled the books of two small midtown businesses. I would arrive in the morning, get a cup of coffee, settle into my closet office, spread out the accounting book, and sort the receipts and bills. All day I entered numbers into the ledger, reconciled the bank statements, paid the bills, wrote out deposits for the bank, and prepared a summary of the accounts. As a job for an artist it was great. Everything was in past tense and everything balanced to zero. And zero was what I brought into the studio from my day’s work. That is, unless the ledger didn’t balance. Then the gentle dull routine of my day turned into a snarled and agitated scuffle as I poured over the bills, receipts and columns of numbers to find the missing pennies. That was the cubicle - a mindless routine interrupted by the crisis of minutia. Struggling through the pit had provided me with a new approach to drawing (geometric, clean and organized environments) and I started a new set of stories - this time with Keaton in Kafka’s office cubicle. I had reconnected my core matter with my subject matter and the object matter came along as a result. One year latter the pit arrived again. Its looming presence was evident in the apparent disintegration of the cubicle in the drawing "Drip." I could tell by how the surface was becoming agitated and how difficult it was becoming to draw up new subject matter. However, the struggle this time was easier. I had plotted my own escape within the drawings themselves without even knowing it. Drawing these versions of hotel landscape and abstract paintings were some of the invigorating moments in creating the C drawings. My sketchbook contained a lot of these while working through the pit. Let me insert a bit of an aside here and offer a word of wisdom to art students. Back in 2007, I had an underdrawing that I destroyed. In that underdrawing one piece of business I worked on was to have only the clothes left behind after the character jumps out the window. I didn’t use that business and in fact destroyed the whole drawing. In 2012, unknowingly, I had a similar interior and remembered the business. It worked. In the period between 2007 and 2012, that good idea wasn't destroyed when I destroyed the drawing. I explored in C the contrast between the rational geometry and clean surfaces of the cubicle and the chaos and disorder created by unaccountable happenstance. But I had forgotten that during the moments of dull routine when I worked in such a cubicle, I dreamt. I had in my head the next painting, a piece of theater business, fragments of images and spoken lines. How I visualized the cubicle required decorating it with paintings. Drawing those paintings was essentially a visualization of my own bookkeeping daydreams. When putting this lecture together I realized that I had unwittingly created a thumbnail of a drawing I would create two years later after emerging from the pit. This drawing, "Papers," is superimposed on that early work. I had plotted my escape from the 'C' series in "Remnants." That was the only drawing in the series where the man in a necktie didn't appear. Escape is the dream of the cubicle. This new series, Dreams and Disasters, is just the latest iteration of the core matter I’ve been expressing through my subject matter for over 40 years: that there is no firm ground under our feet; that the thin veneer of civility, of security, of happiness can be taken away at an instant; and that identity, language, place, memory is perishable. I have two drawings in the studio. I don’t know if the hook will remain or if the drawings will even survive, thereby joining the ranks of my most prolific series to date - destroyed drawings. As long as the art drug pushes us to express our core matter, we will continue to face the pit and be seduced by the zone. Ironically, this is our reason to persist as artists: that which can never be satiated requires that we explore new subject matter and new object matter no matter how absurd the effort. If page isn't functioning correctly, open a PDF version here.